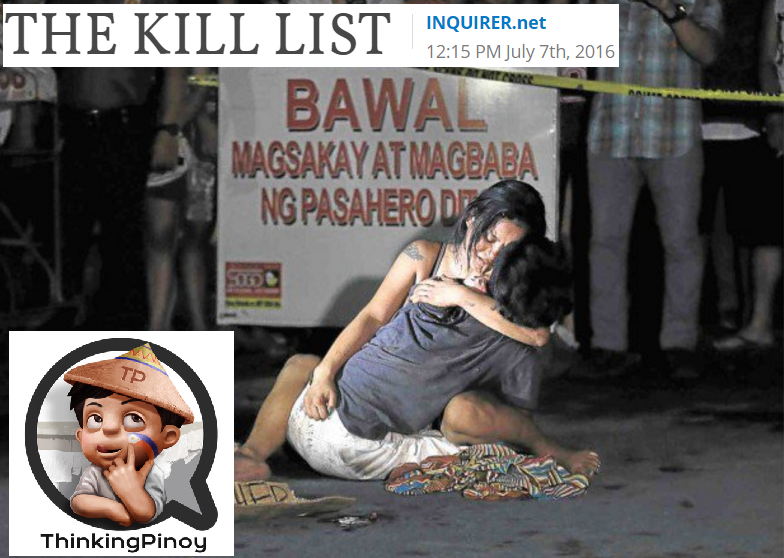 On 07 July 2016, the Philippine Daily Inquirer published “The Kill List”, described as “an attempt to document the names and other particulars of the casualties in the Duterte administration’s war on crime”. The list is being updated twice weekly, with latest being on 15 August 2015. Since President Duterte took office on 30 June 2016, Inquirer claims that there had been 646 deaths as a result of Duterte’s war on crimes. At face value, “casualties in the Duterte administration’s war on crime” indicates that this list includes all murders since 30 June. If the Inquirer mean it to be worded this way, this list is essentially meaningless, as there is no distinction between murders allegedly perpetrated by the administration and those that would have happened with or without a war on crime. If Duterte didn’t declare a war on crime, would there be zero murders? That’s highly unlikely. Aside from this, there are other glaring issues in Inquirer’s methodology that has to be pointed out. FIRST, the problematic use of “surge”. The Inquirer’s claims “marked and unmistakable” surge of killings since 30 June, which suggests a sharp rise in the number of deaths, is misleading. Inquirer failed to mention a baseline figure, a starting point of comparisons. Claiming the existence of a “surge” requires the claimant to show that 646 deaths in July is markedly higher than, say, the deaths in March or in April of this year. To show a “surge” requires a comparison of figures, something that the Inquirer did not provide. The Inquirer’s claims are near-impossible to cross-check, especially since there over 100 entries that simply state “Unidentified drug suspect”, along with the fact that the Kill List does not cite news articles to back up each of its claims. Notice the phrases “probably killed” and “who might have assumed”? Who assumed that the hitmen “probably killed” and “might have assumed”? The Inquirer? That is editorializing. That is, the inquirer is making comments or expressing opinions rather than just reporting the news. FOURTH, police doing their jobs honestly. Bumagat was killed while serving an arrest warrant. I am outraged at Bumagat’s death, but is the Inquirer suggesting that the police should not do its job? Is Inquirer a closet anarchist? Based on what little information Inquirer provided, it’s clear that the cop Turaray is a drug suspect who’s under surveillance. He could have also been killed by one of his accomplices who have knowledge of the surveillance, right? The Inquirer should eliminate this possibility before concluding that the war on crime is to blame. SIXTH, entries that came (or will come) back from the dead. Unless they revise the list to include “confirmed dead”, the Inquirer basically showed that at least some of the 600-or-so entries may actually be alive. Essentially, this is not a “Kill List”, but a “Maybe-a-Kill List”. SEVENTH, the kill list barks at the wrong tree. Jose Ipo is clearly a government asset. Are we blaming the government for something that is more likely perpetrated by drug cartels instead? Wouldn’t this justify a more intensified war on crime instead? This entry is self-defeating, to say the least. The Cupta couple reported a drug user, and they were killed by that same guy. The killer surrendered three days later [CDN]. The Kill List is clearly an affront to Duterte’s war on crime, so how exactly did the war on crime cause the Cupta couple’s death? This makes no sense. EIGHTH, those not on drug lists. If Barientos was not on his local drug watch list, who said that he is “allegedly involved”? Sure, it’s not the police, because it will contradict the fact that he isn’t on the watch list, right? The phrase “allegedly involved” seems to be a case of editorializing. Aside from qualifying under 7: Barking at the wrong tree, this also qualifies under 5: False Dichotomies. But wait, there’s more. Why would the Inquirer automatically include Pavia in the kill list? If he turns out to be a hero, the Inquirer would have already cheapened his memory. This is can actually turn into a libel case against the Inquirer for vilifying the dead [AbogadoMo], especially since this is a clear instance not only of malice, but actual malice, or the blatant disregard for the truthfulness of the statement. Entries 4 to 9 on 03 August 2016 details the deaths of five bodyguards of Albuera, Leyte Mayor Rolando Espinosa Sr. during a shootout. Inquirer used the term “shootout” (involves violent resistance to arrest) instead of “rubout” (outright killing). Hence, why should the Kill List rouse public anger if it really were a shootout? Does the public expect the police to just go home if a suspect refuses to surrender? Or worse, just to play dead when the suspect starts shooting? These are just ten of the glaring deficiencies of Inquirer’s Kill List, showing that this controversial list hardly qualifies as scientific evidence against the War on Crime. With the plethora of illogicalities throughout the document, ThinkingPinoy wonders why mainstream media even bothers to use this justify their criticisms. Now, let me ask: aside from this dubiously-created list, is there anything else that fearmongers base their conclusions on? Or do critics insist on believing on the Kill List just because it best fits their prejudices?